For all the times we walked past the Bibliotheca Pinacoteca Accadamia Ambrosiana (Library-Gallery-Academy; for now The Ambrosiana) I didn't ever see anyone walk in. People walked past, an occasional couple would sit outside, on the newly cleaned up piazza, smoking, or chatting, an arm around a shoulder. And this despite a banner advertising a large exhibition of da Vinci drawings that might, somewhere else, have generated queues around the block. 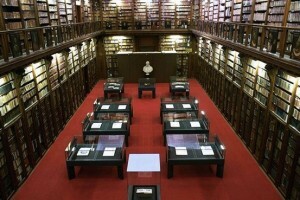 Not to mention the gallery collection; not to mention the library; not to mention the buildings. It has been sitting there for four centuries, atop the foundations of the Roman Forum. It is named after Ambrose (Aurelius Ambrosius, St Ambrose), the 4C bishop of Milan, defender of the Trinity, none too kind to Jews and Milan's patron saint whose body lies in the crypt of Sant'Ambrogio to this day. 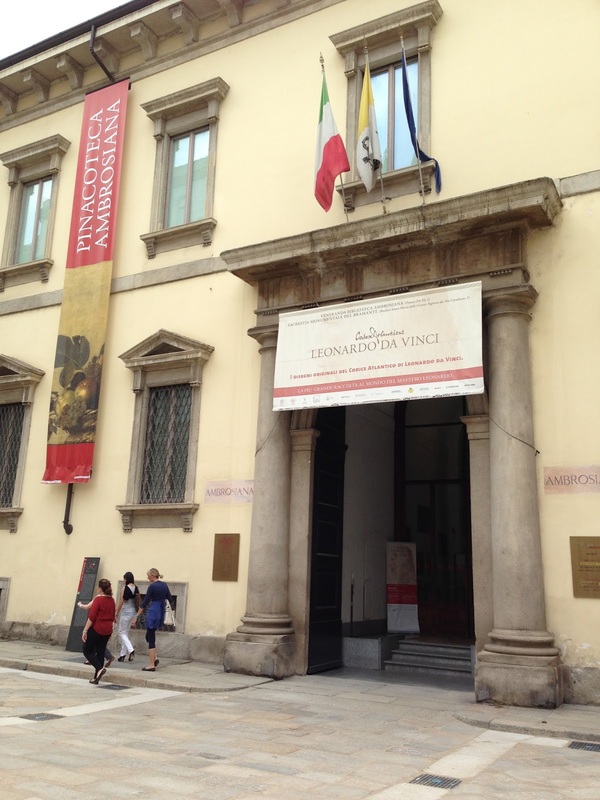 Established as a library in the early 17C, with an escalating collection of Church manuscripts and books, assembled for the first time by stacks vertically up the walls, it would be extended to include an expanding collection of paintings, the Pinacoteca. The Academy is a recently established project with the aim of an east-west-north-south dialogue between peoples and cultures with study classes, publications, gatherings and exchanges. Entry is into the Gallery section of the buildings (above) and up a grand staircase there are two levels each of several rooms with sparingly displayed works and a couple a real treasures. It is a joy for the gallery weary, and we were. The link above is for exploring and some rooms can be displayed and scrolled around. 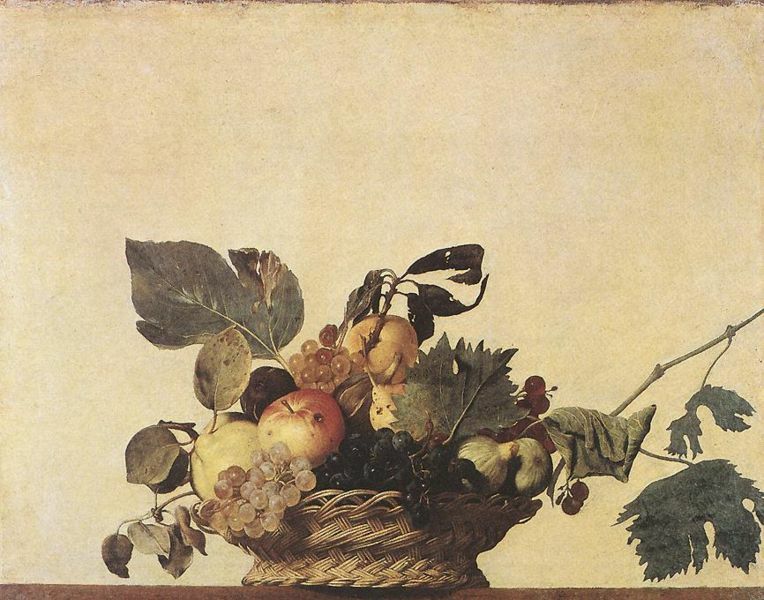 In a room of its own is Cararvaggio's Basket of Fruit. Nothing quite prepares you for it and the immediate impact is that it is small (by Caravaggio standards) and the colours have faded; for a colourist like Caravaggio this is very muted. The basket sits strangely on a table reduced to the barest of horizontals, and the basket is full, spilling over, the fullness itself only just balanced while the painting skews off sideways with a grape vine to nowhere. It looks quite pleasing as you stand at the room entrance and see it there, directly ahead. And whatever the metaphor, it compels you to closer inspection, as close as you can get, and then that's not close enough, as you become increasingly aware of the decay, the sweating grapes, the wilting leaves, the worm holes, the truth behind impermanence. The da Vinci Portrait of a Musician was on loan to Tokyo; another case for going back. 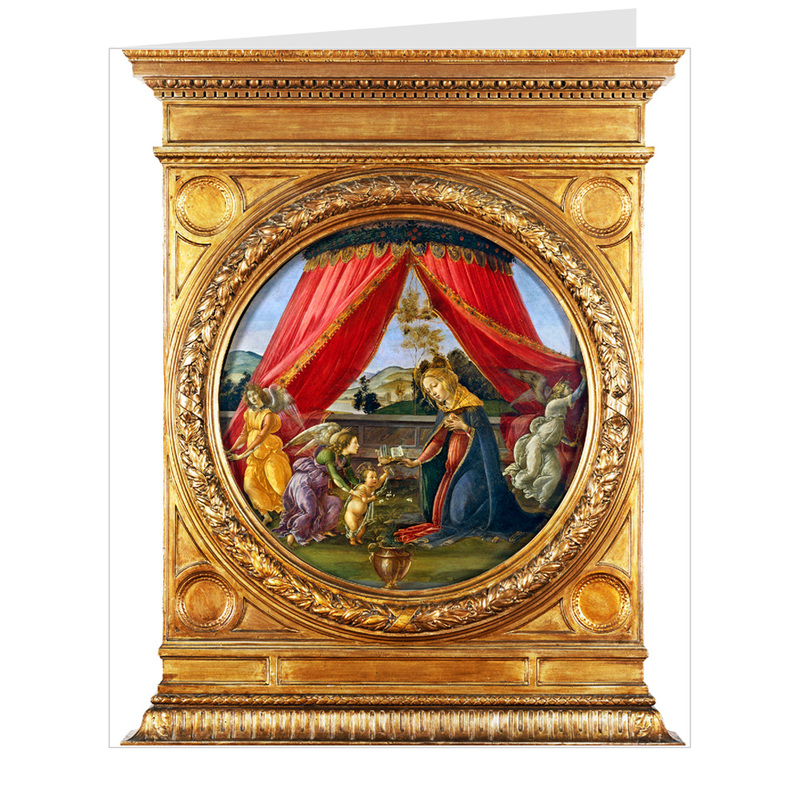 And just when you think 'one more madonna and child and I'll ...', there appears the most compelling of them all: Botticelli's stunning and completely unexpected Madonna of the Pavilion. 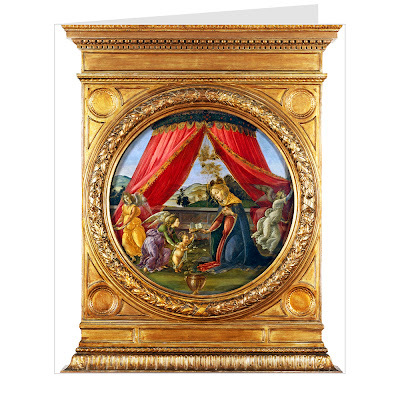 It needs to be seen in as much detail as possible (clicking on the source below - the Met shop - will bring the painting up, and another click will enlarge it). I had to be dragged away. The colouring is exquisite, and the claret red drapes of her opened virginity, drawn apart by the angels, is what arrests you, arcadia beyond, and slowly moving closer come the faces, the love of the mother, the hesitant child, the urging angel, beyond description really. Her matching red garment beneath the blue cloak is still heavy with childbirth and with one hand she expresses her love and nurture in a translucent milky arc from her cupped full breast, the other outstretched in reassurance to the open mouthed infant. The guiding angel is transfixed not by the child but the Madonna and the angel on the right looks unfinished. It is too too beautiful and very hard to leave. 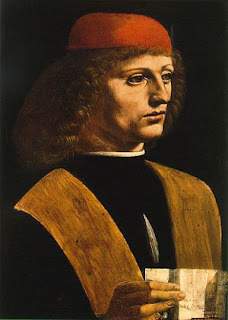 Frederico Borromeo is the man behind the Bibliotheca, into which the Gallery leads you, and what Manzoni (up he pops again) has to say about him can be read here, on Septizodium. It's a remarkably unchanged place of history, walls lined with precious texts and manuscripts, dark and moody, and the centre was given over to room length glass cabinets displaying an astounding number of da Vinci's drawings, page after page after page of sketches, ideas, concepts, all in the finest of sepia lines. There were two other people in the library when we were there. Through heavy red curtains, you find the exit, and it's back to the present. The exit is actually the entrance to the Bibliotheca, and I confess I don't know who the statue is. Although it is my photo (as is everything unless otherwise accredited or linked) I was thinking of other things. I presume it is Ambrose or Borromeo. One I always wanted to see on various visits but for various reasons never did (and not much of the Brera seemed to be on show either). Should a gallery EVER lend its prize exhibit? I suppose if it can travel...which I believe the National's Titian Bacchus and Ariadne can't. It's a little gem really, tucked away there, so next time I hope you make it. The Brera we didn't even try and tackle, but I did get to the 20th C, mainly to see the Morandis, and the view onto the Piazza del Duomo. I heard or read that allusion at the time, probably on the audio guide; I don't make notes (comme tu) but the colour, the shape and shading, the warmth and texture - all there. Did you clickety click on the source reference and see it enlarged? It's worth it. The Caravaggio is what draws me in most here, so unlike other works do his I've seen, at least at first glance. Yet, as you so beautifully describe, the worm holes and other signifiers of decay are certainly of a piece with the little I know of him and his work. Susan, next to the painting was an interactive where you could see the work magnified, moving a 'looking glass' over a reproduction. It has none of that 'sock you in the eye' his big stuff has, but the impact of the detailing, when you get up close and personal, is no less.